This would be a great night to put you in the mindset for this holiday season and remind you what it's all about. 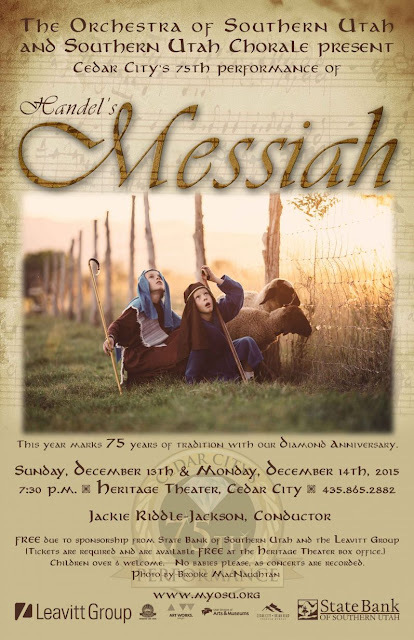 The Orchestra of Southern Utah and Southern Utah Chorale present Handel's Messiah. You have two nights to choose from so be sure you get out and enjoy the music. Cost: FREE thanks to the sponsors (State Bank of Southern Utah and Leavitt Group)! Even though they are free you will still need to get tickets by calling (435) 233-8213 or e-mailing emilyosucedarcity@gmail.com Make sure you re seated by 7:15 or your seats will be given away.